In any game, it is important that each of the player's mechanics has a specific function that is unique to that mechanic. When mechanics aren't unique, or when they overlap with other mechanics, the core design begins to clutter itself. After all, why design a move that is only slightly different from another move? When answering these questions, of course, the minimum degree of difference is taken into consideration. But pinning down the minimum degree of difference for a fighting game requires an unconventional perspective. Typically, in a fighting game, the only thing that matters is defeating one's opponent. Because the opponent is human (lets ignore computer AI for the purposes of this article) repeating the same move can yield different results because of the opponent's reactions. In other words, overcoming one's opponent mentally or via game rules is the only objective. Beyond this player dependent goal, fighters generally don't challenge the player or force them to use their mechanics in any specific way. Establishing a set of mechanics that comprises the primary function(s) of a game as well as a set of supporting secondary and even tertiary mechanics is the first step to designing a well-rounded game. Well-rounded design is creating a set of mechanics that don't overlap or clutter each other in function. These mechanics must complement each other to create a method of expressing the spirit of the game. It can be tricky to get a player to play using all of their mechanics (ie. in a well-rounded fashion). One way is to heavy handedly add abstract mechanics so that players are rewarded for mixing things up regardless of how unnatural it may be. Devil May Cry's style meter is a perfect example of such an attempt. Because the player character is over powered, the enemies/environments don't provide much of a threat to the player, and there's an excess of moves that overlap in function, the creators of DMC found it necessary to create an abstract system that informs the player of how styln/cool they're playing. The more variety players throw in, the cooler they are (or so the meter tells me). The other method is by incorporating a decay system into a well-rounded core design. As players tighten up their game strategies, often times, they cut moves completely out of their repertoire. If a move isn't strong enough, fast enough, or special enough then it really isn't effective in a fight. Even in a well-rounded game, players might stick to only using a few of their best moves. While I highly value player freedom, there are ways to design a game so that the player is naturally/organically encouraged to branch out and use a variety of moves. Stale-move negation in Smash is such a design feature. Stale-move negation in Smash is simply a decay system where moves are weakened when used repeatedly in succession. When a move is weakened, it not only does less damage, but it sends the opponent flying at a fraction of the distance/speed. In high level play, players carefully save their strongest attacks (kill moves) until their opponent is at a high enough damage or in the right position. By saving one's kill moves, the rest of one's move set becomes that much more important. This strategy naturally creates momentum from linking weak moves to strong moves to kill moves that highlight each move type's unique function. Such results from a decay system is only possible in games that are dynamic and well-rounded to begin with. Designing an effective decay system is very tricky because the decay must be designed as dynamically as the core game itself. In Brawl, just having a move weaken in damage and knockback isn't enough. Because all the moves decay at the same rate, a super strong move is still quite strong when weakened to 80% of its full power. Furthermore, weaker moves only get weaker. The damage and knockback of a move only can only decay to about 40% of their original strength. So, for the moves that are difficult to defend against and/or counter, stale-move negation isn't an effective deterrent. Damage and knockback may be the two main factors of attacks in Smash, but the game is far more dynamic than that. Positioning, animation lag, multi-hitting attacks, and stun are just a few factors that stale-move negation doens't affect. What's worse is that stale-move negation doesn't create interplay. In other words, I can't weaken my opponents moves without taking the hits. Take it from a tournament Smash player, willingly taking a series of hits isn't a good strategy. These two deficiencies hold back the decay design in Smash. Some games have excellently design decay systems that are dynamic according to the game's core design and create interplay that uncovers the depth of the gameplay. Take Advance Wars: Days of Ruin as an example. The red arrows point to the 3 decayable stats. In Advance Wars every square counts. As players take turns engaging in warfare their units begin to decay. Every time a unit fires it loses a unit of ammunition. Every space a unit moves drains a point of gas. Every percentage of damage a unit sustains takes away HP. 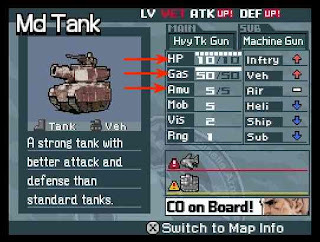 Ammo (attack), gas (movement), and HP (defense) make up the core mechanics of Advance Wars. And each of these stats decay in a unique way that dynamically changes the functions of a particular unit. Without gas ground units can't move while air and sea units crash and burn. Without ammunition a unit cannot attack enemies or fire back when attacked. Additionally, every unit of HP determines a unit's attack power, defensive power, and for infantry units how quickly property can be captured. Because moving, defending, and attacking make up the bulk of the core gameplay of Advance wars, the decay system effectively influences the core gameplay according to the primary mechanics. In this case, the decay mechanics agree with the form of the game and are directly manipulated by both player's primary mechanics. I've successfully run strategies where I force my opponent's strong units to waste their ammo by attacking them with several weak units (defend). Even a powerful tank like the one in the image above is useless without ammo. I've forced enemy sea and air units to explode after running them around the map until they ran out of gas (movement). And I've sacrificed small groups of units to push through enemy formations to damage their infantry unit so it couldn't capture my property as quickly (attack). When the decay system is properly integrated with a game's core mechanics, playing around the dynamically changing situation uncovers a game's depth by making the properties, intricacies, and interconnections of their mechanics more apparent. By property designing a decay system into a game players can be influenced into playing a dynamic well-rounded game in a more dynamic well-rounded fashion. When the core design of a game is constructed in the spirit of the game, "playing to win" can be synonymous with "playing for fun" or "playing in the spirit of the game." It is unfortunate that these seemingly contrary play attitudes weren't fused in Brawl's core design. Didn't Guilty Gear (I'm only familiar with # Reload right now) have some decay elements? I know Jam Kuradoberi could store charges for moves, which seems similar to ammunition. It doesn't force you to distribute your charges, but good players will distribute them to do the most damage (I think). Similarly, Johnny has the coins which he uses to charge up his Mist Finer attacks. While this mechanic is included in FPS games, I don't think it improves gameplay very much. It usually means saving more powerful guns for bigger enemies / bosses, or using rockets against tanks where they give you tons of extra ammunition anyway. I think the best use is in Tactics and Horror games, which gets into what I was talking about Fallout 3 earlier about resource management. In some of these games, you're forced to conserve resources for future enemies because the enemies are hidden out of sight on the same level or part of some future level which you have to fight through before returning to a safe zone to replenish your resources. Alternatively, sometimes you can escape early at extra cost to the entire dungeon (sometimes just the additional travel time). I'm not too familiar with Guilty Gear, but from what you mentioned, I'm sure it does have some decay elements. Whether or not these elements significantly affect battle strategies is a different issue. Without getting further into Guilty Gear, the game is a straight forward "give the opponent damage" fighter that has several meters/abstract mechanics on top to balance things out. For these reasons, the game may not be well rounded to begin with not to mention the excess of abstractions. The reason you don't think decay in ammunition doesn't affect FPS games much is because they're typically not very dynamic or well-rounded. Because shooting doesn't have much interplay, it's difficult to create a set of other supporting primary or secondary mechanics. Usually, you're left with a melee attack and a grenade or two. Also, because these games generally give the player access to many guns on the field or the ability to carry many guns, the decay affects of using ammo is greatly diminished. Perfect Dark does a great job of gun decay. As for you Fallout 3 example, how can you strategize to conserve resources for what "might" come up later in the level? Sounds like how I played Resident Evil for the GameCube. I stored up so much powerful ammo just in case the worst came that by the end of the game, I had a huge stock pile of powerful weapons I didn't use. For these tactics games, you get a rough idea of the size of a particular mission based on previous experiences. Basically, each level for a mission will be about the same size as the first level and you'll hopefully know how many levels are in the mission, where levels are often literally levels in a building. Also, missions and levels don't increase drastically in size for each iteration, so you won't need a drastic increase in the amount of equipment you carry if you did fine on the last mission. The fallout games and many tactics RPGs also have you travel to the missions and you face random encounters along the way. Then you have to leave enough resources for the trip back. You don't get to the point where you're able to store up a ton of resources until the endgame, because you're limited by money. Also, different towns will sell different goods, so you can't pick up everything at once. As for the actual action of conserving resources, one example would be using your different aiming options appropriately. With submachine guns, you could fire a powerful spread shot hitting multiple targets at the cost of extra ammunition. You could also hold off engaging enemies inside your technical range but outside your effective range, meaning you aren't likely to hit them. If the enemy is well inside your effective range, you could try aiming specific parts of the body. For close enemies, you could risk using melee attacks. Lastly, you could carry a backup weapon with more plentiful ammo. X-Com had different levels of rate of fire and stances, which effected your accuracy, movement, and probability of getting hit, as well as body part specific attacks. I can't remember if the Fallout series had any of that. I remember Serious Sam had some ammunition decay gameplay, with different weapons having various levels of effectiveness against different enemies (all handled organically, not with resistance). You would often face waves of enemies where you had to manage your ammunition over the course of the battle. Most of the enemies projectiles moved slowly enough, as well as most of your more powerful guns, that the game had some gun interplay as well.